Editor’s Note. Originally this article contained pictures that were external links. Unfortunately these no longer work and the images have been lost. “Most times the answer is ”A leetle “.The most times when I tell them that I speak Hebrew ”A leetle” comes this great smile! And then I ask my questions. And always I get welcome replies with some suggestions and info. These short chats are of great value to me. 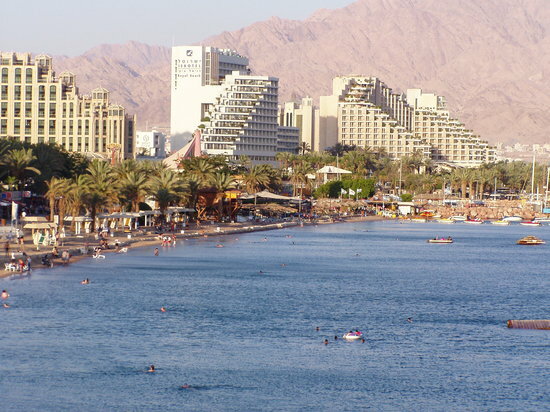 Eilat, on the Red Sea with a fantastic climate is a draw card for holidaymakers from all over the world. There are many beaches, some camping sites with all types of sea water activities and facilities, and eating places and coffee places with some modern smart hotels, and “shady places” as well. There are also shady places to sit on promenades and during holiday times the buses from the North bring holidaymakers, and the airplanes land at the airport which is in the centre of Eilat and is next to the main road. Like any Port city, there are characters of all descriptions; long haired weirdoes, bald head ordinaries, lots of bikini clad mermaids, and some mothers and children as well, and there are open markets and many benches to sit on. I suppose some must-sees would be the Oceanarium -Yellow Submarine, the Dolphin Beach & Diving site, the Eilat Lagoon and marinas, and new Lagoon Park. Also the shopping malls, the parks, maybe the floating casinos, and bird sanctuary, and when you have a map, available from most hotels, you can pick and choose the places of your desires. If you feel like a camel ride or a jeep tour, those are also available. Also, I suggest a drive around the city to see the old neighborhoods, and the new smart high-rise apartment buildings, and again the fancy hotels, and everything and anything. Let Google find Eilat, and see for yourself! So for whatever length of time you choose to stay in Eilat, we can start right now on our tour ! Let us first take some time, perhaps, one hour, to ride on Route 12, maybe as far as Red Canyon for a look and a little walk, then back to Route 90 and north, and a short look-in at Kibbutz Elot on the left to look at the little zoo which the kids will love. Then when I looked up I saw these hundreds of birds flying in the thermal and coming in close to the cliff and they continued to come into view (hundreds of these magnificent birds)! Then as soon as the shops opened I went to buy a “bird-book” and I went straight to the bird sanctuary to discover other amazing “things” And I now have some new “interest” in birds, thanks to the 2 bird counters, who gave me a few seconds of their time to give me a quick explanation and tell me the birds are Honeybuzzards. Later I met them again at the bird sanctuary and again they were busy, but gave me coffee from their flasks. So, just another small, great, happening at the right moment in time. At the entrance to Eilat on Route 90 is the Arava Border Crossing into Jordan, which I rode past a couple of times always wondering “what?” So I rode to the kiosk which had an opening facing the car-park, and bought a cool-drink and had a tiny chat through the opening with the occupant. He invited me into his kiosk and I received a special visitors card allowing me to go through the gates to get to the kiosk door. He invited me to join him for breakfast that he was preparing for himself, and he told me many stories and happenings in his life, and about his family. Because of a drop in tourism, almost no people were coming to cross into Jordan, so his plans for expansion and renovation were ended. While chatting, I told him that day was my birthday, so he went to a shelf and opened a bottle of wine to celebrate my birthday, and our meeting. Then he told me about a few places I should visit in and around Eilat. Regrettably, on my following visit, the kiosk was closed. Right place at the right time? NextNext post: Artie. It wasn’t about Big Bands, it was about The Big Bang. since i know you .